With Valentine's Day this weekend, we thought it'd be a great time to roundup our favorite love-related links from around the web! From DIYs to color palette inspiration to date night ideas to Galentine's Day, you're sure to find a favorite amongst these features. 1. Who doesn't love the gorgeousness that is henna? Well, add that with sugar cookies and you get these Valentine Heart Cookies on The Big Fat Indian Wedding that are both scrumptious and stunning! 2. I'm a sucker for watercolor and free printables, and Budget Fairy Tale has some very sweet Valentine's printables for you to print or to pin. My favorite is the "Let Me Count the Ways" one… it has words in the shape of a silhouette! 3. Bright red Volkswagon bug alert! This retro Valentine's love shoot on Chic Vintage Brides is just too cute! 4. Love love and love the color red? These wedding styling tips using the bold and beautiful red from The Perfect Palette translate perfectly for Valentine's Day! 5. We are smitten with marriage around here, so anytime to celebrate that is a winner! This Valentine's Day DIY Dinner Date inspiration on Every Last Detail will get you pumped to orchestrate a special evening-in with your sweetie for Valentine's or any day of the year. 6. Glamorous and fun, this blush and white-hued Valentine wedding inspiration on Hey Wedding Lady is perfect for couples wanting to get married on the day of love! 7. Looking for what to wear on Valentine's Day or for a February wedding as a guest? Look no further beyond Dress For The Wedding's red and pink wardrobe inspiration, especially if you love Kate Spade! 8. Red, white, and preppy. This Valentine's wedding inspiration board on Burnett's Boards is filled with cuteness and fun. It's perfect for any playful couple! 9. Remember our DIY lip balm last? Get ready for a great gloss recipe! It's the most adorable DIY Organic Cranberry Lip Gloss there ever was on Classic Bride… perfect for the holiday of love! 10. If you're celebrating Galentine's Day with your best gal pals, this sweet DIY pink and white flower arrangement on The Budget Savvy Bride is the perfect touch to the table. Have something to share that you're gaga for Valentine's? Post below in a comment! Photo by Bit of Ivory Photography. 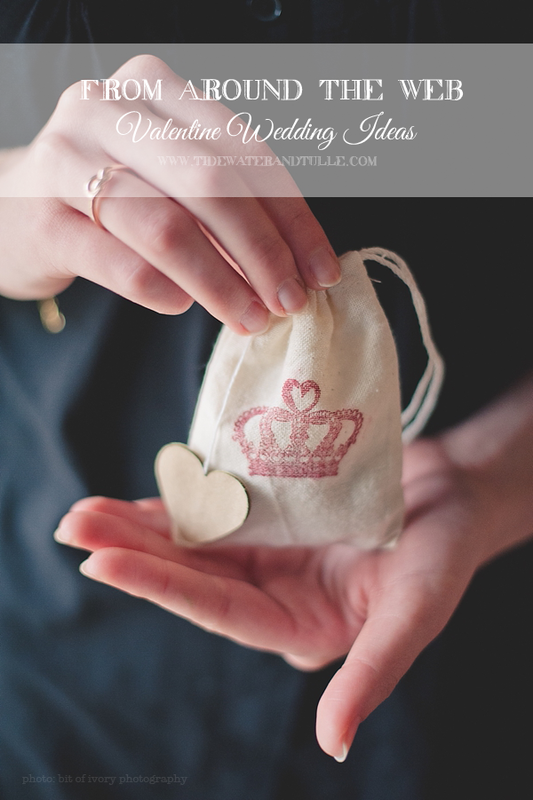 For the DIY on how to make these Queen of Hearts tea bag favors, head over to the full feature.